Handwritten digits recognition is a classic problem of machine learning. The objective is to recognize images of single handwritten digits(0- 9). in This example We will apply FANN and FANNTool on this problem. 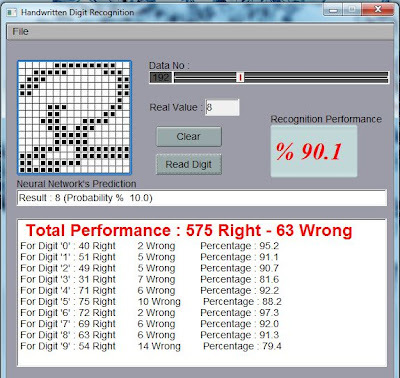 Semeion Handwritten Digit Data Set is used for training and testing. whose value was under the value 127 of the grey scale (127 included) and setting to 1 each pixel whose original value in the grey scale was over 127). Finally, each binary image was scaled again into a 16x16 square box (the final 256 binary attributes). Firstly We train a ANN for this Data set by using FannTool. After that we write a demonstration program to show a results.